A cream and green fabric lampshade. A quality handmade lampshade designed to clip on to the lamp bulb suitable for wall lights and light fittings. The Victoria lampshade is a ruffled pleat lampshade in cream chiffon fabric and finished with a bottle green velvet trim top and bottom. The Victoria lampshade is hand made to order in the UK and will take approximately 4 weeks. 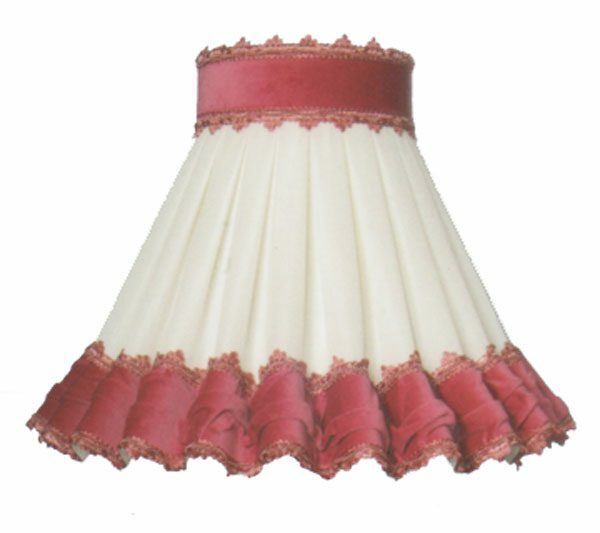 (The shade illustrated is shown with a pink velvet trim).